Hyundai doesn’t bother pretending any of its vehicles are SUVs. No, the Korean automaker sells cars and crossovers; choose your size and take your pick for the urban jungle. The Santa Fe Sport is its mid-sized crossover, a five-passenger vehicle with a bit more space all around than the compact Tucson. If you want a larger Hyundai crossover, you’ll need to spend an extra $3,000 or so for the seven-seat Santa Fe XL with its standard third-row of seating. 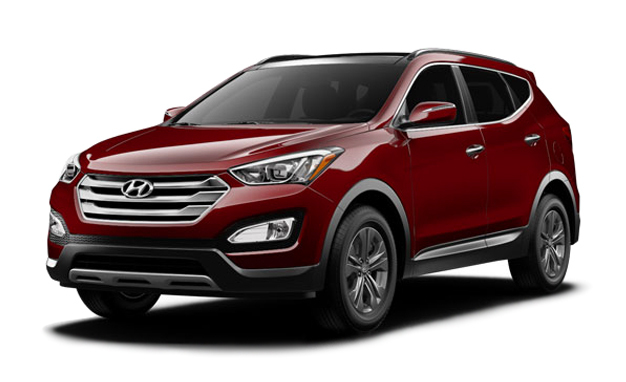 The Santa Fe Sport is a handsome vehicle – no pointy snout or in-your-face grille, just a pleasing symmetry Hyundai calls “fluidic sculpture.” That’s designer-speak for body creases and shallow headlights that are supposed to lend an aggressive look to the vehicle. Whatever. Stuck in traffic on the way to work, covered with a layer of salt brine in winter, it’s all the same. Most people would be hard-pressed to spot the differences with any number of competitive crossovers. The “Canyon Copper” paint of my tester, however, was very attractive and let the Hyundai stand out in any parking lot. The cabin in the top-of-the-line tester was very well finished indeed. Comfortable seats front and back, with standard heated seats even on the most basic model. The cheaper versions offer fabric seats that are easy to clean and maintain, but you can upgrade to some very nice leather in the three most expensive editions, starting at $35,199. There’s lots of soft-touch black plastic but it’s well presented, with a matted finish above the dashboard’s faux-wood accent, and a cobbled finish below, echoed in the doors. It gives the interior a layered feel that suggests high quality and technical sophistication, as well as a level of sportiness that continues the aggressive theme from the outside. There are also plenty of well-thought-out cubby spaces for all passengers, and the rear seats are comfortable with ample headroom. They don’t fold totally flat, but they go flat enough, and the 40-20-40 pass-through from the cargo area at the back is smart. There’s an extra storage cubby under that cargo area, too, which is handy for tools and such. There are two engines available for the Santa Fe Sport: a 2.4-litre gas direct injection four-cylinder that makes 190 horsepower, which is probably all you need, or, if you'd like, a 2.0-litre turbocharged version that makes 265 hp. All versions come with a smooth-shifting six-speed automatic transmission. 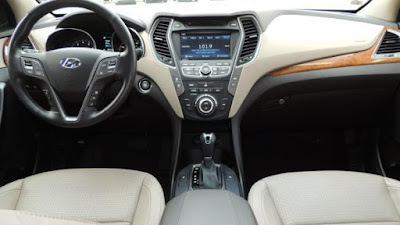 You get what you pay for, but even the base model of the Santa Fe is fairly well equipped, with remote keyless entry, hill-start assist, Bluetooth and steering-wheel mounted audio controls. Once again, though, you have to upgrade to the $35,199 edition to get the (lovely) panoramic sunroof, or the rear-view camera, or the smart liftgate. This last option opens the rear hatch automatically if you stand next to it for at least three seconds with the key fob in your pocket or purse – no need to wave a foot under the bumper like the competition. If you want navigation, HID headlights or LED taillights, you have to splash out for the top-end $38,849 Limited 2.0 that’s tested here. The two least-expensive editions are front-wheel drive only – this is a crossover, remember, not an SUV. But if you spend at least $30,999, you’ll get standard all-wheel drive on all other versions, available with both engine options. The top-of-the-line tester here came standard with AWD and the 2.0-litre turbocharged engine, and it was great fun to drive. It’s much more powerful than most of its competition, which offer the stronger engine only in larger vehicles. Toyota, for example, used to provide a 3.5L V6 engine in its RAV4 that made 270 hp, but scrapped that option in 2012 – most buyers looking for that kind of boat-pulling power preferred to just step up a size and purchase the Highlander instead. With the powerful engine, the Santa Fe Sport pulled strongly on the road and didn’t care about hills, even when loaded with passengers. The steering can be set for comfort, normal, or sport, with a 10 per cent difference in firmness between each setting, but I just left it on normal. Similarly, the transmission lever can be flicked to the left to jog through the gears manually, but I didn’t bother – mashing the pedal to the floor always did the trick. Around curves, the AWD system includes active cornering control, braking the inside wheels if necessary to handle acceleration. It helps make this crossover very nimble and difficult to upset. Claimed fuel consumption for the turbocharged engine is 12.9L/100 km in the City and 9.8 on the Highway, with the less powerful engine saving just over an extra litre every 100 km. In practice, the tester returned 10.0L/100 km over a week of combined driving. That’s good for such a powerful motor on a relatively large vehicle. The Santa Fe Sport holds well against most of the competition – Hyundai knows its drivers will cross-shop for their vehicles. The base model is a bit of a loss leader, though, and its $26,899 price will lure in many drivers who end up paying a fair bit more for AWD or convenience options. If you’re content with fabric seats and FWD, then the Sport is a good deal. That 2.0-litre turbo makes the Santa Fe Sport probably the quickest mid-size crossover available. If you care about that, the $33,199 for the most basic model with that engine is an attractive deal. This is a very competitive segment for any auto maker, with compact and mid-size crossovers being the most sought-after vehicles on showroom floors. Santa Fe Sport is no let-down – in fact, its high-quality cabin and smart use of space, as well as overall good looks, make it a pleasing surprise. If you want to add some actual aggression to your drive, on top of the perceived designer aggression built into its creases and “fluidic sculpture,” and you want a mid-sized vehicle, the more powerful engine is the only way to go. It’ll be fun, and probably won’t break the bank.